Michaela Colette Zacchilli’s recent entry on Rob Goodin’s awesome Covered blog has got me reminiscing about Mark Texeira. 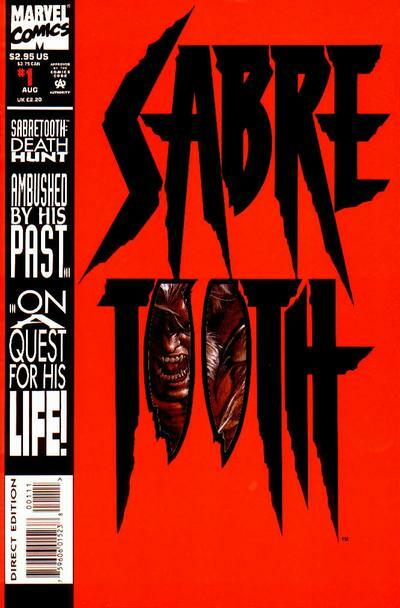 I’m showing my roots here: I came of age reading Marvel comics in the mid-90s, and one of my favorite mini-series was the unfortunately titled Sabretooth: Death Hunt, created in 1993 by Larry Hama and Mark Texeira. A lot of Marvel’s work during that period is absurdly inconsistent, but there’s some good stuff lurking in the mini-series (if only because the consistent creative team and clearly-defined parameters mean that you get a coherent artistic statement). Texeira’s art here is like a bizarre hybrid of Frank Miller, Todd McFarlane, and Rob Liefeld — often pretty close to the filthy lumpy style of Sam Kieth (apparently they both worked on Marvel Comics Presents in ’90-91). 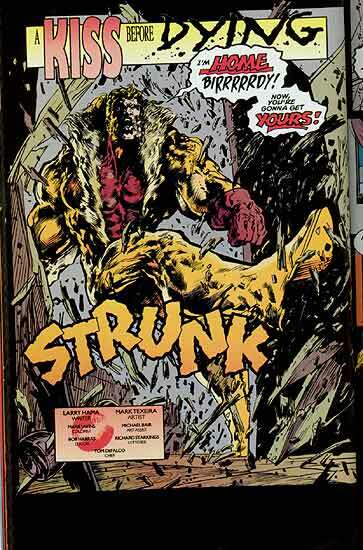 Hama’s over-the-top script is matched by a ferocious energy on the part of Texeira, as befitting a Sabretooth story. 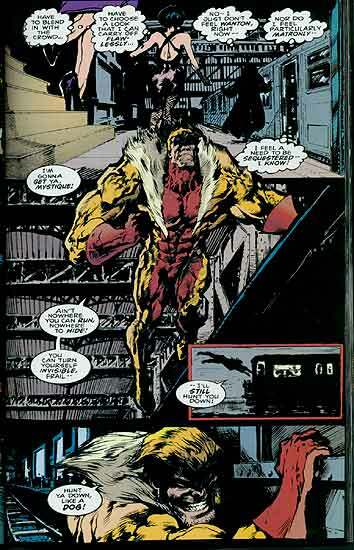 I think the first issue has Sabretooth coming home to find his mansion overrun by ninjas (it happens), so he and his personal assistant have to shred and blast their way through a couple hundred ninjas before settling down to dinner or something. 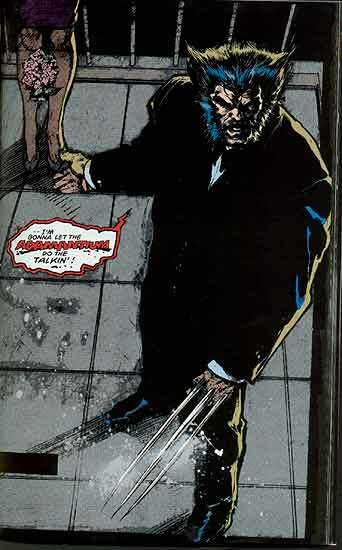 Issue three had Wolverine in a suit. Who draws Wolverine in a suit?! I love it. It was the age of gimmicks, so the cardstock cover is die-cut to reveal a painting of the titular character (I have a MMPB airport thriller from 1995 that does the same thing). 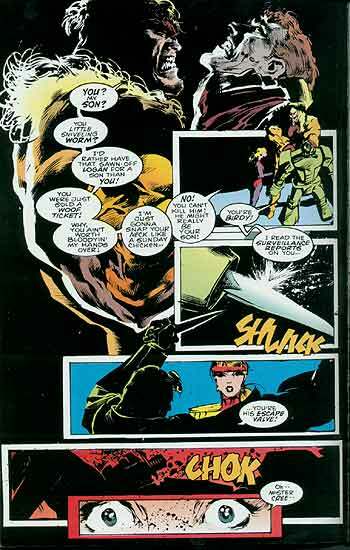 But the whole thing is actually kind of admirably restrained — would Marvel run something like this today? — and I especially want to appreciate the text layout in the sidebar to the left. This sort of type-play is a very early-90s graphic design idea, made possible by the rise of desktop publishing software and digital typography. And in most cases it doesn’t age well, now that the novelty has worn off. But here it’s pretty restrained, keeping everything right-side-up and using only 2 or 3 font families. I remember seeing the same design used in a bunch of house ads for “Bloodties,” the X-Men/Avengers crossover from 1993. I’ll have to dig those out sometime: the story itself was forgettable, but those house ads (I’m remembering punch-out trading cads with pull-quotes from Nick Fury commenting on various characters) made the whole thing sound immensely important. But I’m still fond of the design. So why can't I just say what I mean, Jean? I think that you're pretty keen, Jean. (aloud)           I'm less confident than I seem, Jean. My courage just runs out of steam, Jean. You're all that I ever could dream, Jean. If it weren't for you I'd have been caught, Scott. But Magneto's plans came to naught, Scott. I thought I'd lost it all. I'll be an X-Man again! But the Phoenix power lives on. I'd only been Marvel Girl before. Now it desires to soar...and devour. I've tasted blood but I need more. Fear, oh fear, oh fear, oh fear me! Don't dare to come near me!